On Track Innovations’ Saturn 5000 contactless reader has received Terminal Type Approval, Level II from MasterCard’s Approval Authority, certifying the reader’s application and electronics for use in the MasterCard PayPass contactless payment program. On Track Innovations Ltd (OTI), a global leader in contactless microprocessor-based smart card solutions, for homeland security, micropayments, petroleum payments and other applications, announced that its Saturn 5000 contactless reader received certification from MasterCard. This is in addition to the already certified card solution announced earlier this year. This makes OTI the first and only company to date to obtain certification on both its MasterCard PayPass compatible card and reader solutions. OTI’s Saturn 5000 Contactless Card Reader recently received Terminal Type Approval, Level II from MasterCard’s Approval Authority, certifying the reader’s application and electronics for use in the MasterCard PayPass contactless payment program. The Saturn 5000 is built to allow quick upgrades of existing POS terminals to accept contactless payments, with the reader facing the customer for easier payment experience. The Saturn 5000 can support multiple applications and is currently compatible with all major POS terminal providers. Supporting the major financial contactless programs, the software integrated in the Saturn 5000 can read a variety of sources including credit cards and key fobs. The reader certification completes the MasterCard PayPass approval process and now allows for mass deployment. In August, OTI, together with Atmel, announced that they had received the first commercial quantity orders of contactless microprocessors. At that time, OTI had received card technology certification on the card solution. OTI’s card inlay solution also successfully passed MasterCard’s Card Quality Management tests. MasterCard PayPass provides a simpler way to pay for purchases where speed and customer flow are essential, such as in quick-serve restaurants, convenience stores, gas stations and toll roads. Since cardholders can quickly pay with a simple tap of the card, a MasterCard PayPass card is more convenient to use than cash. MasterCard PayPass contains a contactless microprocessor chip and antenna inside the card, in addition to the card’s standard magnetic stripe on the back of the card. 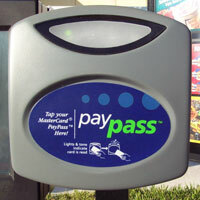 OTI has worked with MasterCard on its PayPass program from early in its inception. OTI is providing the contactless solution expertise, including the operating system, application support and inlay technology. It has successfully integrated its inlay technology with leading U.S. card vendors and has already integrated its Saturn 5000 reader solutions with multiple point-of-sale providers to support MasterCard’s PayPass program.